Miniature golf is generally enjoyed by those looking for friendly entertainment but is taken more seriously as a competitive sport in a variety of professional leagues. Across the globe, you'll find families, teenagers and couples as well as experts playing this skilled putting game. 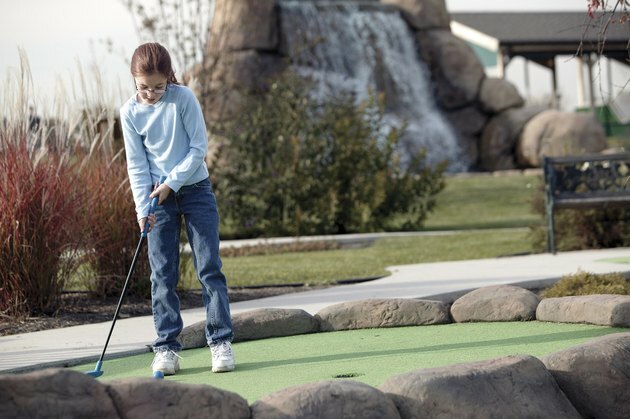 Mini golf or putt-putt golf does not require much from the individuals playing once the miniature golf course is picked out. The only equipment players need are a putter and a golf ball, which are supplied at the course. Each course has unique variations so every hole is different. According to World Minigolf Sport Federation, obstacles on the course must be fixed for the purpose of play. They cannot totally hinder a shot. Mini golf courses have 18 marked holes that are numbered. Players must complete each hole in number order without skipping any hole. Players use their putters to hit the golf ball from the tee area and straight into the hole. The objective is to make it into each hole in as few strokes as possible. Every stroke taken counts as a point, although many courses limit players to a maximum of seven strokes per hole. The player with the fewest strokes at the end of the round wins. According to the World Minigolf Sport Federation, before every stroke the ball must be addressed with the putter held in both hands. Accidental contact with the ball does not count as a stroke. When the player begins his backswing, a player is deemed ready, and strokes will count if the putter makes contact with the ball from that point. If on a player's first shot, the ball does not go past the red or border line, players must shoot again from the tee. If the shot does go past the border line and then bounces out of play, the player will have a one-shot penalty and he takes his third shot at the spot where the ball went out of bounds.